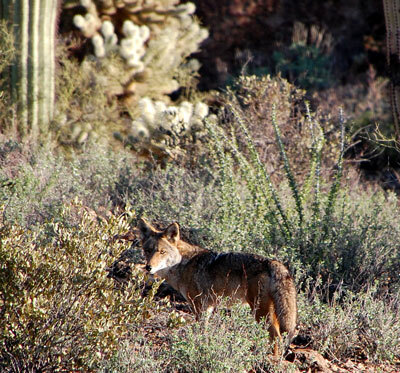 A marjor portion of the Tucson Mountains have been preserved as undeveloped Sonoran Desert beauty. The northern 2/3 is protected as Saguaro National Park and the southern 1/3 in Tucson Mountain Park, a unit of the Pima County Parks. The most astounding feature of these lands are the stands of saguaro cactus, in places tall enough and dense enough to be thought of as a cactus forest. Desert beauty is preserved in close proximity to a modern city and all its conveniences. The mountain range lies to the west of Tucson with several driving approaches possible. The most direct is via W. Speedway Blvd. after exiting I-10 at exit #257 and turning west. This route ascends to Gates Pass along curving mountain roads - recreational vehicles and trailers should not use this route. Gates Pass is 12 km (7½ miles) west of I-10. 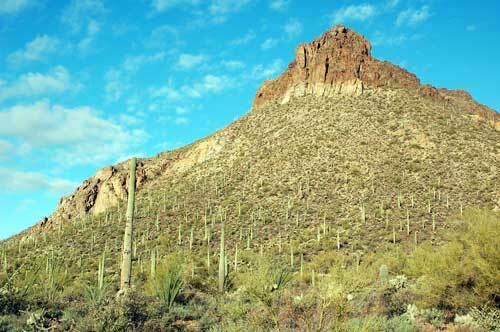 The park and the Tucson Mountains are also accessible via Ajo Rd (I-19, exit # 99) west to Kinney Rd., then north. From this route picnic, camping and hiking trails are easily reached. Also found within the boundaries of TMP are Arizona-Sonora Desert Museum, Old Tucson Studios, and the Sonoran Arthropod Studies Institute(SASI). Golden Gate Mountain (elev 1286 m) at the southern end of the Tucson Mountains as viewed from the David Yetman Trail. Photo taken 21 Feb. 2010. On Sunday, February 21st, the morning was damp after good rains overnight and the day before. With high pressure building in, clouds were lifting into cotton balls over the rugged mountains and bright sunshine was illuminating the many saguaros. The parking lot just west of Gates Pass is rather small accomodating maybe a dozen cars, but I was alone as my hike began. I hiked the David Yetman downhill to the southeast and towards Tucson Estates with its encroaching patchwork of bedroom homes - their march halted only by the established park boundary. February 17, 2012. Sentinel Peak, is also known as 'A' Mountain because of the large red, white and blue letter emblazoned near the summit. When I first came to Tucson to attend the University of Arizona, this was one of my early experiences with the Sonoran Desert. A paved road ascends most of the way and it is clear that a lot of foot traffic impacts this small city park. Even though the spring has been too dry I found a number of wildflowers in bloom. Thumbs of many are shown at right. Buffle Grass, an invasive weed was seen blooming on the mountain. From downtown Tucson the hill is reached by driving to the west end of W. Congress St. and turn southwest onto Sentinel Peak Rd and enter the city park. Close at night. In general order of Abundance. Coyotes are wary and this one was not keen on my attention. 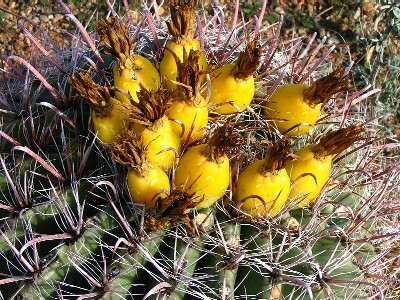 Fishhook Barrel fruit begins maturing in September turning bright yellow. This photo taken by John Owens. Buffel Grass -- Pennisetum ciliare - invasive! 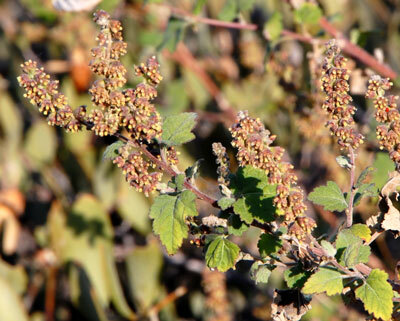 The leaves of Tucson Bur Ragweed look a bit like small versions mulberry leaves; blooming mostly in April. 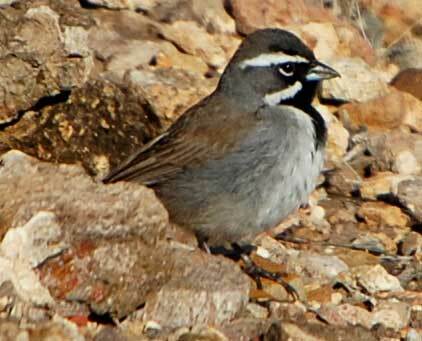 Photographed in Pima Canyon, Sta. Catalina Mts., Pima Co., Arizona. April 22, 2009.